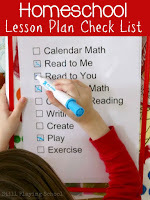 I was a teacher when we had our first daughter but I never imagined I'd leave the classroom to homeschool her. We're on our third year of homeschooling full time. Next year we'll begin homeschooling our son as well. We've all learned so much. My educational philosophy is full of smudge marks and editing notes.Mmy teaching is totally different at home than in was in public school. 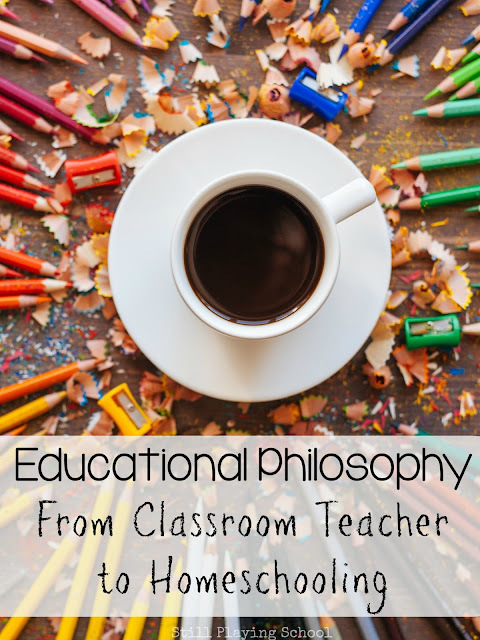 In college our professors asked us to write our educational philosophy before we officially had our own students to teach. I made up what I thought sounded good but later, looking back, I realized that I had no idea what I truly believed about teaching until I was a teacher. Even then my beliefs and ideas were changing with every new student who walked into my classroom. Doesn't every teacher and parent for that matter have a constantly evolving set of beliefs and best practices that are challenged daily? Homeschooling is the same. In the beginning, I was unsure and made up decisions as we jumped in. Now that we're a few years into the process. I've realized that I've learned just as much as the kids have about this new way of life and learning. It's also changed me as a teacher and a mom. As our experiences year after year fuel my passion for homeschooling I am reading more books and blogs on the subject to see what others are doing, thinking, and feeling about this lifestyle. 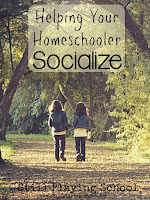 We are becoming more secure and outspoken about our own journey into homeschool. I'm inspired to share that here where our little seed of playful learning at home was planted in 2011. I'm talking daily to friends who also homeschool for regular support and inspiration. One of my very best homeschooling friends writes at Stir the Wonder. Together we're teaming up to write about our homeschooling journeys regularly. 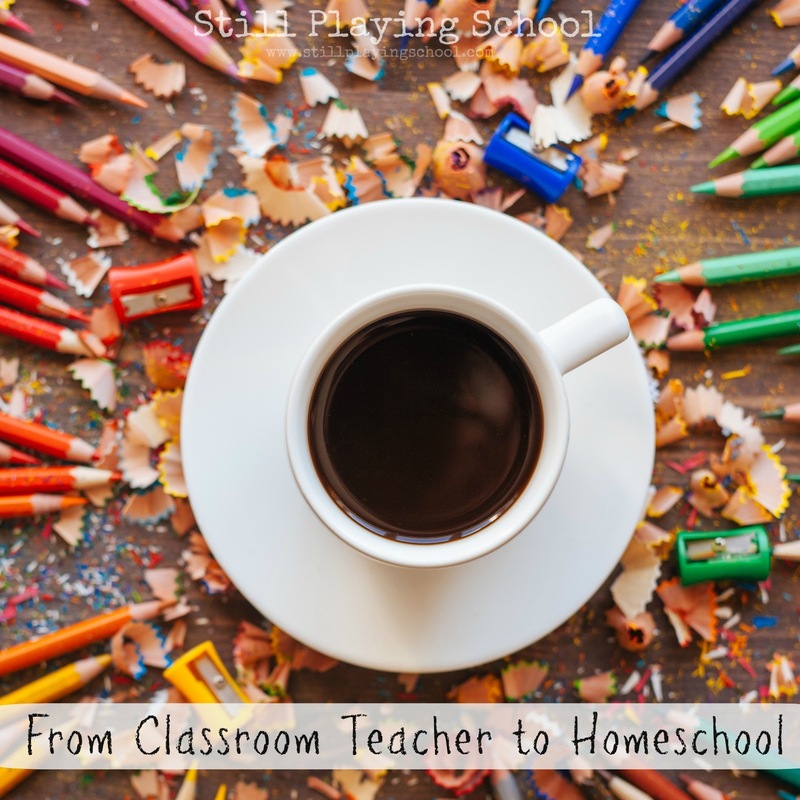 We started by discussing our current (and ever changing) philosophies about how we homeschool. When I was baffled about where to begin, she suggested I take Eclectic Homeschooling's quiz What Kind of Homeschooler Are You? After taking the quiz, I realized that I might not be able to put my homeschooling educational philosophy into words easily, but we are certainly already putting it in to practice. I'm also struck by the fact that I teach very differently here at home than I did in the public school classroom. What works best at home may not be possible at school. It doesn't mean that I think any less of the public school system or that I myself or any of my colleagues weren't or aren't doing their best for every child that walks through their doors. The beauty of homeschool and the freedom we have to educate our children in this way is that it can, should, and will look different in every home and from all public and private school classrooms. I believe that children learn best when interested. I don't think any teacher doubts that students learn best when interested and engaged. The issue lies in the simple fact that even on an amazing day in the public school classroom I was at best hoping to have the interest and attention of most of my class. At home, I can allow our kids' current interests to lead our learning. We can build a curriculum that covers all subjects based on what they are passionate about and invested in. I believe that homeschool should be tailored to children's needs, strengths, attention, and motivation. When I see that I've lost one of my two children's attention for whatever reason we can easily switch gears, break for lunch, or put a project away for another day. Much in the same way, adults can often take a walk around the office at work or stop to chat with a colleague to ask questions or recharge. It's impossible to switch gears for an entire classroom of students every time one child is hungry, ill, or distracted. At home, I can set up the learning environment so that my son can move as he learns and my daughter can incorporate her passion for art into every single project she creates. Some homeschoolers will start their day bright and early because their kids wake up then while others enjoy a slow start after they sleep in. That can even change from year to year or child to child in the same home! The smaller student to teacher ratio allows for strengths and needs to be met on a much more individualized basis. I believe the environment should reflect the learning it supports. Art, music, science, games, food, and nature all are immensely important to our family. Our home and homeschool reflect these passions while putting them at the pinnacle of our lives. We listen to music while we eat lunch. We go outside to read when the weather is pleasant. We cook together as a way to practice reading, math, and enrich our family culture. We play board games to reconnect with each other as we review skills we're learning academically at the same time. Our home and schedule can be arranged and changed to support our homeschool. It also showcases our projects and passions in a way that shares who we are as a family. From leaving the classroom to unexpectedly homeschooling for preschool to loving the lifestyle several years in, I always tell anyone who asks that we're taking this year by year. Sometimes it's month by month or day by day but the flexibility in that is what is allowing our homeschool to be successful. As our kids learn, I change as a teacher and a mom. I'm constantly monitoring their needs and strengths to adapt what we're doing to fit who they are at the moment. I wish I could have done the same for all of my students. I'm sure I'll be back to update this regularly as our philosophy changes or I realize more vividly what we believe. If you're like me, you'll love to take a glimpse into another homeschool to see what drives their learning. 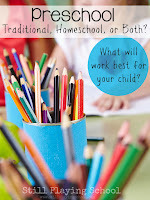 Read about Creating a Homeschool Philosophy That Works for Your Family over at Stir the Wonder. I'll be right there to join you...I just need to make another cup of tea first! Thank you for sharing this interesting and insightful post! I don't have personal experience on homeschooling, but after reading your post I am considering more seriously the option. Children do learn best when interested. This is a valuable truth that more than often shapes the personality and the future educational motives of our little ones.